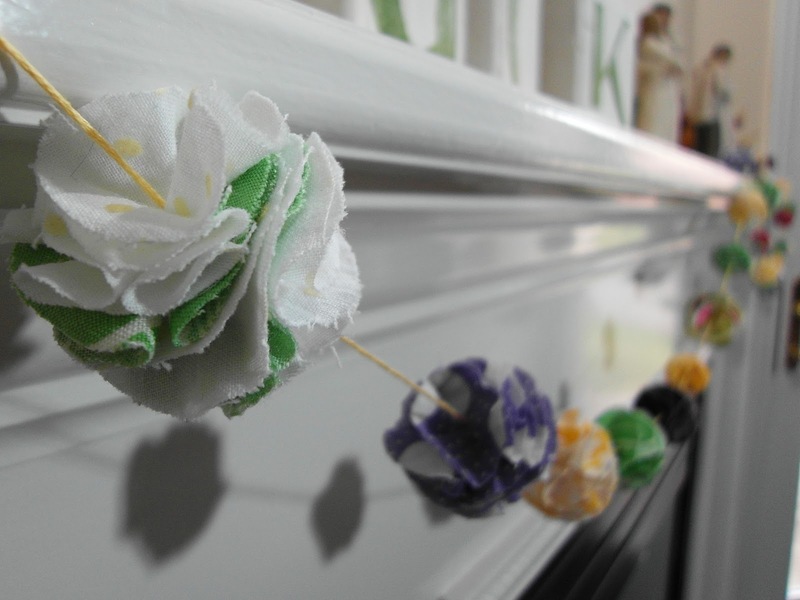 ' Scrap Flower Spring Garland - Sisters, What! While visiting sister Joy, I came across her vast fabric scrap bucket full of wonderful colors (she picks out the best fabrics for her quilts). For fun, I started making scrap flowers. 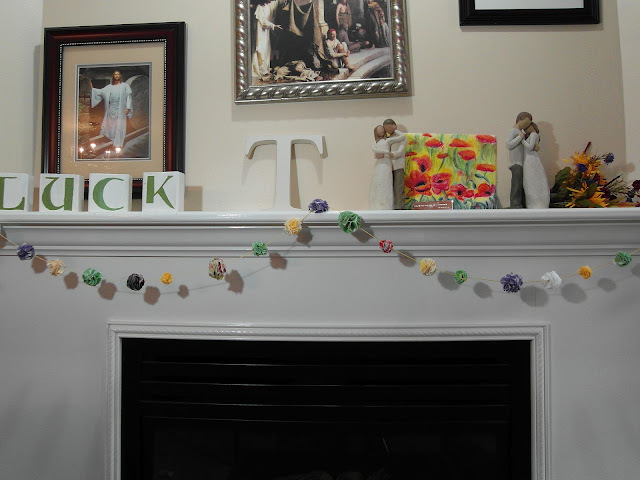 After a few random flowers, I came up with this idea of putting it on a garland. So after making her a plethora of flowers, I came home and immediately went through my own fabric scraps. It was the perfect little project for the 3 hr drive to and from Columbus (don't worry, I wasn't the one driving). I wasn't sure how I was going to string them. For the one I first made for my sister, I hot glued a piece of straw between the flowers (genius right). But, after I added the straws, my sister and I realized that we'd need thick ribbon to keep the flowers from sliding into each other (not so genius, unless you have thick ribbon on hand). I was going to try a regular needle and thread, but then I thought about using embroidery thread instead. 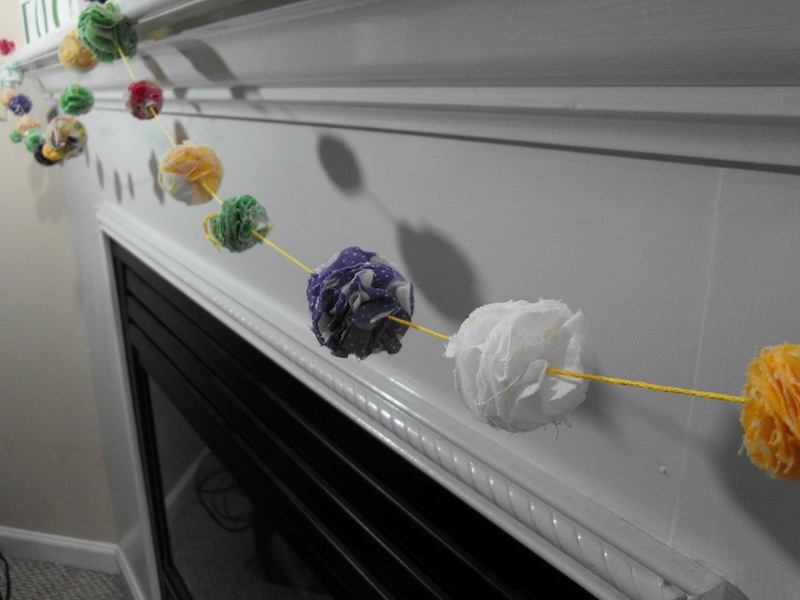 I used a big yarn needle to thread the flowers together and it worked like a charm. I didn't even need to tie knots between the flowers because the thread held the flowers in place. As for the actual flowers, I sort of made them up. 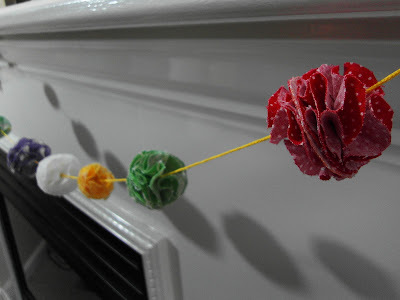 After making two flowers, I stuck them back to back and then threaded the embroidery thread through it to make them look ball shape. Here are a few excellent tutorial for you that shows you how to make flowers pretty similar to mine. 2. Make and Love it Full and Textured Flowers - if you want really really really full flowers, but it might take you longer to make the flower. I love that I was able to find another use for my hopeless scraps. I imagine fabric scraps are like the forgotten toys on Toy Story; they also long to be used for a good and happy purpose. Wowie. So cute. And btw, afterwatching a million episodes of hoarders, it's so much harder to let myself save things (sothanks for the excuse ;D). Aaaand, Toy Story has become a somewhat disturbing show for he hoarder in me for that very reason;D.
So cute! Great use of scraps! What a beautiful flower garland! Havalah I love it! What a great idea to bring a little spring into the house! thanks for sharing. Congrats! Thanks for sharing with us!